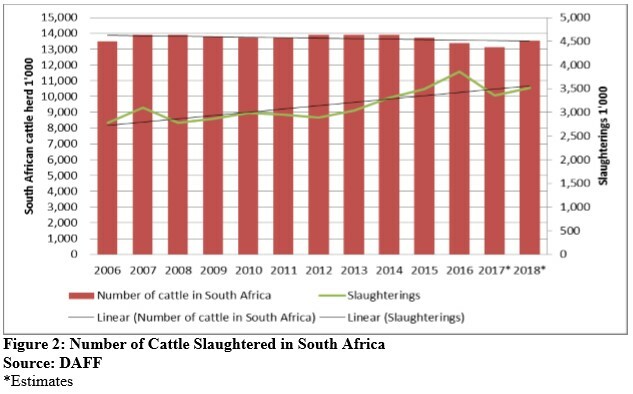 In 2016, South Africa slaughtered about 3.8 million cattle, which is a 33 percent increase from the number of cattle slaughtered in 2012 (see featured image). This increase can be attributed to a number of factors, but the most notable one is the 2015-16 drought. Farmers slaughtered more cattle that year due to a shortage of grazing pastures and to high animal feed costs. With the drought having ended in early 2017 in most parts of the country, farmers started restocking their herds, which meant a decline in slaughtering activity. Moreover, the relatively lower maize and soybean prices, as well as a good recovery in pastures provided a conducive environment for the livestock rebuilding process. This year, however, could present different dynamics, the United States Department of Agriculture forecasts a 4 percent year-on-year increase in the number of cattle to be slaughtered (to 3.5 million cattle), due to the expected increase in demand and a general recovery in the industry performance. Above all, these slaughtering dynamics partially explain why meat inflation remained stickier in 2017 (a year characterised by a decline in slaughtering activity). This year’s meat price inflation will again partially be influenced by the path of this slaughtering activity. Fortunately, the outlook is fairly positive on the meat price inflation front as the USDA hints of a possible increase in slaughtering.